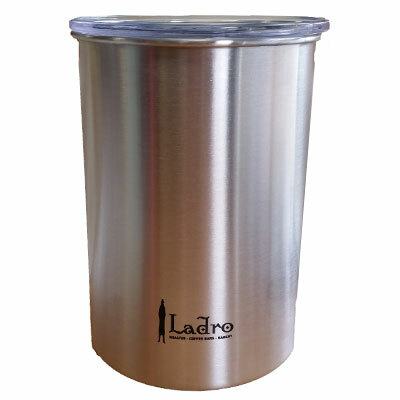 This airtight container is ideal for maintaining the freshness and flavor of your stored coffee. Its inner lid seals down to the surface of the beans, minimizing their contact with oxygen and maximizing their shelf life. 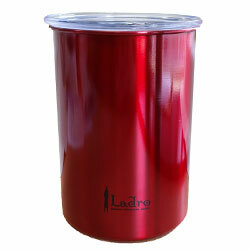 Ladro’s logo is printed in black on either red or stainless steel for classy display in your kitchen. Inside surface is stainless steel. 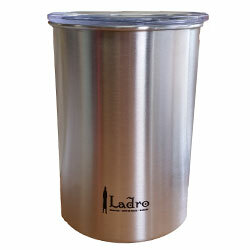 Simply the best method of home coffee storage on the market today. Container is 7” x 5” and holds 64 fl. oz., or approximately 2ea 12oz bags of coffee beans. From DANNY GROOMS of West Union, Ohio on 2/6/2017 . Have only used a few days but it seems to be of good quality and was some what larger than I had expected. Was a little disappointed that it was not made in The USA but would purchase again. From James Randall of Atascadero, California on 12/12/2015 . Best bean or ground coffee canister I've ever used. I have several of this brand. 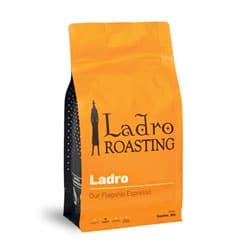 I especially like your 'Thief' of Ladro coffee Roasters logo on this canister.